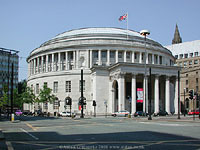 I have been meaning to ask you for some time about the picture you put out for us ex pats, the one of St Peters square, I have it as my wallpaper, and receive many accolades about it, what I want to know is does the high light in front of the entrance to the library really only have three lamps in it, or is one missing? every time I turn my pc on it catches my eye, but I still think it is a fantastic photo. Today it is pouring down again, and it is wonderful to be able to go on a trip around Manchester and forget the rain. Looking at the original, high resolution version of the photo, I see that one of the four bulbs has blown. You might also ask why are the lights still on and wasting electricity in the middle of the day, but that's a question for Manchester City Council. My original purpose for Eyewitness in Manchester was to show what Manchester looks like today, but I soon found that lots of people appreciate the pictures because they remind them of times past. And the few e-mail messages I received in the early days have grown into a community of people brought together through my photographs and articles. I'm very glad that my work brings pleasure to people! I certainly enjoy doing it, in fact for me, it's a form of relaxation. 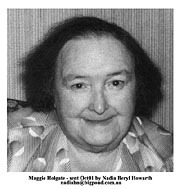 All the burly men in their oilcloth aprons and clogs knew my old Gran - otherwise known as 'Maggie Holgate' to everyone. Smithfield Market and Shudehill with the old 'Hen market' was the excitingly pungent terrain that she led me into, and going along with her to sell newspapers during school holidays on pre-dawn bus journeys into town was quite an adventure. From the 'knocker-up's' first tap on the bedroom window at 4.0.AM to the intoxicating headiness of the chilly frost-laden air as we stepped out into the still-slumbering streets, I was in another world, until we returned home at around midday, tired and ravenous. We lived at 37 Abbott Street in Collyhurst since I was about a year old, but I was actually born just behind and across Rochdale Road at 52 Pilling Street. I can still picture her as she looked when I was about ten years old. She always carried her loaded newsbag bearing the legend 'Manchester Evening News' slung over her shoulder, and waddled from side to side with the weight of it as she walked. She was a tiny round figure, with a remarkably smooth soft face, thin dark hair that never greyed and comfily bosomed, perfect for resting my head on. The infectious way she laughed and joked with the market men and her wide toothless grin are very dear memories of mine. She could always be seen at her pitch on the corner of Shudehill and Bradshaw Street, right opposite Thomas Street and Lockhart's Cafe, now known as the Abergeldi Cafe, I believe. This was a good location which served the workers who were walking between Victoria Station and the multitude of shops and offices in the area. Maggie had a little stool which was kept for her at the cafe and she carried it across the road to set out her papers outside the Rope & Twine merchants on the corner, but she had no form of shelter from the rain and snow, and would only move a few feet along to sit inside the shop doorway if the owner asked her to. She was very aware that she didn't want to cause any inconvenience to his business. The bundles of newspapers and magazines would usually be already there waiting for us when we got to Gran's corner, having been simply flung from the delivery van, so the first job was to cut through the strings that bound them up and get them into the canvas newsbags out of the rain. She never had a proper display stand such as they have today. Maggie 'inherited' her corner from her father who had also stood there for years. She used to go with him during school holidays, just as I did, and when he died suddenly when she was only twelve years old, the brave young girl took over the family business immediately so as not to lose any customers. It was 1914 and her older brother had gone to the war and her younger brother was just too young ! By 10.00 AM on most mornings the customers were thinning out so we would pack up whatever was left and go across the road to 'Lockhart's' cafe for breakfast. This was quite an occasion for me as this was my total experience of 'dining out' I would feel like a princess as I ate my thick slab of a 'bacon butty' and sipped from my huge mug of strong tea, just as the market men did. It was a great comfort to sit amongst them in the hot steamy atmosphere and listen to their yarns and raucous laughter as they puffed away at their pipes and cigarettes The clatter of clogs mixed with the shouts of the counter staff as they would call out breakfast orders down the hoist-shaft to the kitchen below. ' Two bacon, egg and sausage ..one welsh rabbit.two teas and one coffee...' And the meal of your choice would be hauled up five minutes later. After a long breakfast we would catch the bus for home, except if it happened to be a Saturday morning. That was 'collecting day' when we would leave the cafe and make our way through the Fruit and Veg and then the wet and slippery Fish Market collecting payment for the week's papers which would have been picked up by one of the men and distributed amongst the employees. I would be sent to climb up the long steep staircases that ran up to the office cabins which seemed to be terribly high up to me. I believe you can still see them. As far as I know, Maggie didn't keep any written records of who had what, but in the main I believe that most folk were honest and paid her the correct amount that was due. As we went from stall to stall we'd be given other little extra's, such as a cabbage, some carrotts or a bag of apples. Potatoes would be dropped into the newsbag along with the occasional whole fish, well wrapped in lots of paper to minimise the smell. We were never quite sure of what had been popped into the bag until we got home and emptied it out. Sometimes we would also be given a bunch of flowers and this was really lovely, because we could never have afforded to go and buy flowers from a shop. But Maggieís day didn't end at midday. We also served the Collyhurst people by delivering the Manchester Evening News and the Evening Chronicle to the surrounding houses at tea-time. We employed a couple of paper-boys to do this, along with also delivering Sunday papers too. So, as you can see, it was really a seven day job and the only days my Gran didn't work were Good Friday and Christmas Day. It was Gran who recognised my love of reading and she allowed me to read all the magazines ( and comics! ) as long as I was 'very careful and turned the pages gently'. She also knew that I loved drawing and would get me little notebooks and drawing paper and cadge pencils from the customers to give to me. Maggie was everything a Gran should be and how I hope that my own grandchildren will remember me. She showed me that hard work could still be fun and she certainly had her share of both until her first and only long drawn-out illness, which robbed her of her child-like happy nature. After developing diabetes and then losing a leg to gangrene, she was bed-ridden for many years and declined into a fragile shell of a woman I hardly recognised as my dear old Gran. I can almost taste that bacon buttie and mug of tea, your description is so vivid! Yes, grans are great, especially our very own 'lola' (grandmother in Tagalog, the Filipino language) Betty Nazario, Ann's mum, who unfortunately had to return to her nursing job in the United Arab Emirates after a stay of two months with us here in Manchester. She is just as great with our baby daughter Adele, as your gran was with you all those years ago. Thanks very much for your contribution. Reader Message: Dear Aidan-- Prompted by a recent visit to your site, I was rummaging around in my photo albums for pictures I've taken during trips back to Manchester over the ten years I've been away. I thought you might be interested in a few, so I'm attaching them to this note. Of course, these pictures are the work of a rank amateur, with a point and click camera, but I hope the images are clear enough for you to make out most of the details. 1. This is, I think, a statue of the angel of peace and is a war memorial. It is located on the top of the rise on the Rochdale Road side of Boggart Hole Clough. 2b. is a picture of Elizabeth Gaskell's beautfully elegant neo-Georgian house in Plymouth Grove and 2a is the blue plaque on the wall identifying her as one time-resident. As one of my particular interests is Manchester writers, or writers with strong associations with the Manchester area, I'm especially glad I took this picture before the council, in its "infinite wisdom", razes the place to the ground--to build a concrete and chrome Asda perhaps. EWM says: I don't think this building will be demolished. It has been used by the university International Society, but there are plans to turn it into a Gaskell museum. The house is in a bad state and needs a lot of repairs. It is easy to forget now--most Mancunians wouldn't know, for instance--that Gaskell was a hugely popular novelist in her day, with an adoring public not significantly smaller than Dickens (she's very well-known in the English departments of American Universities). Her two Manchester novels are two of the best about the heyday of Industrial Revolution and the struggles between labour and capital. 3. I have no idea who this upstanding individual is. I couldn't make out any name on the plinth. Perhaps you or one of your other regular visitors could let me know? This was also taken around 1992, so the statue may no longer be in the obscure setting where I came across it. When I stumbled into it--one dinnertime looking for a quiet spot to eat my lunch--it was located on the short pedestrian walkway that leads down from the Bridge Street bridge on the Irwell. That is to say, it was diagonally opposite the Mark Addy, on the Manchester bank of the river, right behind what I think are the tax offices. 4.This is a picture of (Edward the Seventh is it?) facing Oxford road over the railings of the park near the infirmary whose name for the moment escapes me. As you can see, when this particular photo was taken, around 1992 or thereabouts I think, some whimsical, anti-royalist wag with a big ladder and no fear of the police had "crowned" the king with a traffic cone and given him a bent stick for a sceptre, creating the kind of anti-authoritanian "found art" the dada-ists specialized in in the 1920s. Whether the artist in question is the "slack Bob" identified on the plinth there is no way of knowing. In any event, it seems to me a pretty typical example of irreverent Manc humour. EWM says: The statue is still there and still in an atrocious state. I wonder if a similar statue in St James Park London would be left in a state like this. Manchester City Council seem to have mixed feelings towards statues. They were going to remove all the statues from Piccadilly except Queen Victoria, but I notice they've decided to keep them. Cromwell was removed to Wythenshawe Park, but Abe Lincoln brought in from Platt Fields to Brazennose Square. Well, that's all. I hope you like looking at the pics. It would be nice to develop for today's Manchester the kind of archive of photographs, professional and amateur, that the Central Library has so wonderfully compiled for the lost Manchester of yesteryear. Who knows how much of the landscape present day Mancunians take for granted might disappear in the future, before anybody realizes that what has been replaced was infinitely better, aesthetically and functionally and in terms of the development and sustaining of a sense communal identity and civic pride, than the often rather soulless, corporate stuff that rears up in its place. Thanks for reading. And all the best in your invaluable work. Mark Bates, Westborough, MA, USA. Thanks very much indeed for the contribution, very interesting. Reader Message: Dear Aidan, Regarding the photo you included with the letter from Harold Barbour mentioning the Balmoral Hotel that stood at the junction of Rochdale Road and Collyhurst Road - that building was demolished some years ago I believe. The picture you show is I think, all that remains of a block of tenements that used to stand much further down Rochdale Road, between Rochdale Road trolleybus garage and Thompson Street. Why this "stump" of them has been left,I don't know, maybe you do. There was a similar block on Oldham Road too, maybe they are still there. Although I wasn't a "regular" at the Balmoral at all,I did go in there from time to time and was much intrigued by its collection of old posters of featured shows at the Queen's Park Hippodrome,that adorned the walls. I have clear recollection too, of the trolleybuses that ran in Moston until the mid-50's, and thought it a great pity that they were abandoned, but they did cost significantly more to run than motorbuses - at least motorbuses didn't need expensive overhead wiring to maintain,and weren't affected by unexpected power outages,as the trolleybuses occasionally were. Great website,Aidan,keep up the good work! Thanks for shedding some light on the issue of the Balmoral Hotel - I'm not sure why that 'stump' was left either - It intrigues me whenever I drive past there. As for the trolleybuses, I have memories of them in Piccadilly as a child of about three! The wheels with a flat hub cap and a funny cut off tube in the middle caught my eye. They have old non-operative trolleybuses in the Museum of Transport on Boyle Street. To see working trolleybuses you can to go to the Trolleybus Museum in Sandtoft, Lincolnshire, I hope it's still there. my Mother was born and bred in Lord Street, Gorton. I am realy intested in seeing pre 1950 pic and more info about this area. Any recommendations regarding books etc on Gorton preferably pre 1960 period. Jill Cronin telephone 0161 336 3989. Frank Rhodes telephone: 0161 320 6857. I just want to take this opportunity of thanking you for publishing two letters that I wrote looking for a long lost cousin. I have now found him. In the meantime, due to my letters I have been contacted by several people who knew me and we are now in correspondence. As soon I see an e-mail from you, I switch on and read everything. I do enjoy the Readers Messages and also the articles on different parts of Manchester. Keep up the good work and once again a big Thank You. Edna Cullis, Burlington, Ontario, Canada. Thanks for your message, and very glad you appreciate the photographs and writings! The reader messages are very important and I enjoy reading them myself! Very glad you were able to find your relatives and friends. I am Stockport Council's Project Manager for the refurbishment of Houldsworth Mill in Reddish. The mill project is nearing completion and will provide 70 new homes and hundreds of new jobs. I am trying to build up a picture of the history of the mill. I would be interested to hear from anyone who worked there or lived nearby with their personal recollections of the mill.Glad to hear that Houldsworth Mill is being refurbished. Hope you gain some useful information regarding the history of the mill. OH TO BE SO YOUNG. re; John Collier. DURING THE WAR THERE WAS A MENS TAILORS CALLED THE 'FIFTY SHILLING TAILORS' AND THEY WERE JUST THAT EVERY SUIT WAS PRICED AT 50 SHILLINGS (£2:10:0 IN OLD MONEY). IN THE LATE 50's THEY UPDATED THIS TO JOHN COLLIER BASED ON THE NAME OF THE THEN MANAGING DIRECTOR JOSEPH COLLIER. THE COMPANY NAME WAS PRICES TAILORS AND THEIR HEAD OFFICE WAS IN LEEDS. HOPE THIS BRINGS YOU AND KEITH AND MARGARET COLLIER UP TO DATE. WITH REGARD TO TOM MURPHY I REMEMBER PAULDONS BECAUSE ONE OF THE DOORMEN FROM THE GAUMONT MANCHESTER WENT TO WORK FOR THEM AND CAME BACK AND TOLD US THAT THEY HAD CAN OPENERS FOR SALE AT 4 1/2d ABOUT 2p IN TODAYS MONEY AND THEY WERE NOT SELLING SO HE HAD SPENT ALL MORNING MARKING THEM UP TO 9d (about 4d today) THEN REDUCING THEM TO 6d (2 1/2p) AND THEY TOOK THEM OVER TO LEWIS'S WHO WERE IN THE SAME GROUP AND THEY SOLD THE LOT IN A COUPLE OF HOURS. WHO SAID NORTHENERS WERE CAREFUL WITH THEIR MONEY. Yes, skilful pricing can work wonders for sales! Paulden's was in All Saints, and must later have moved to the Rylands Building, now Debenhams, top of Market St. Sadly Lewis's is history. Thanks, as ever, for sharing your detailed knowledge with us! Hello again. For some vague reason, something was dredged up from my memory the other day. Back in the seventies when Kendal's occupied not only the current building but the one on the opposite side of the road, now Waterstone's (I think), I'm sure there was a tunnel that ran under Deansgate between the two. I seem to remember there was even a little newsagent's kiosk. I wonder if you or anyone else can confirm or deny whether or not I've dreamt all this? If so, does this tunnel still exist, who owns it, and what use is it put to? Yes, there is a tunnel from Kendals, but it leads to a separate building behind Kendals. This tunnel is still in use and leads to a basement sales floor. I'm not aware of a tunnel to the front and crossing Deansgate, but I could be wrong. Another lost shopping tunnel is what used to be the Market Centre. The entrance was off Market St, next to the present day Tesco Metro and it ran underground, parallel with Market Street. Although my recollection is somewhat vague I seem to think that it was in the area where Tesco is now. If I'm right does that mean that part of the underground market is now the basement of Tesco? What do you think ? As I say it is all a little hazy in my mind.. 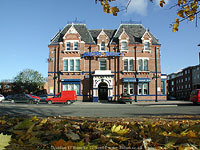 The building which Tesco occupies on the ground floor and in the basement was renovated in the 1990's. I think they may have rebuilt the interior, leaving the facade in place. Next to this building is a new office complex built, I think, around the same time. In order to lay the foundations they will have completely excavated the former Market Centre tunnel, so I expect that it no longer exists. Present Location: Los Angeles, Calif, U.S.A. It is lovely to read your column and see the photographs. I have been away for a long time but I seem to live with one foot in L.A. and one foot in Manchester. I do visit quite often. I was born in Broughton but moved and went to school in Gorton, Gorton Mount School , and then went on to Whitworth street. When living on Mount road I well remember the shops, Greens Grocery store and Dixons the newspaper shop. I used to get all my comics from Dixons and do remember getting the first editions of Dandy and Beano. Sadly I sold them with other comics to a shop during the war for one and a halfpenny for 12. I used to go to Mellons playings fields to fish for Tiddlers and Tadpoles in the reservoir. I used to watch "Manor Lads" football team further up Mount Road where they had a ground behind the Fire lighter factory.The factory had a fire and burned down. I forget the name of the park opposite the factory but I used to watch football there sometimes and even played Sunday football there. Many a time I also went to watch the cricket matches at the Transport ground. That ground was enclosed so it always seemed special. Belle vue was also a favourite haunt to see all the animals and if lucky go on the amusement rides. I also spent many hours watching Belle Vue Speedway with the idols being, Frank Varey, Bill Kitchen, Joe Abbot, Eric Langton, Jack Hargreaves, along with Max Krosskroitz (I know the spelling is wrong but it took me all my time to say it when I was young, never mind spell it) In those days Belle Vue were supremI also used to watch Belle Vue Rangers play Rugby League although they were not the best team in the world. In fact some of the players used to "Lodge" with our neighbours on Mount Road. I also remember the cinema, The Rivoli, being built and opening on Mount Road apposite the dog track. They used to have amateur acts on, along with the film, during the week and then the finals would be on Friday. It was a great night entertainment.I also remember going to the Cosmo, The Queens, The Shaftsbury, and also one on Birch street where there was also the Palatine Bottling company. Many a time they supplied me with wooden boxes for Bonfire night. I used to go occasionally to the Ardwick Empire and remember in particular the Great Dante. also sent to see Snow White and the Seven Dwarfs when it opened at , I seem to think it was at the Ardwick Empire or if not it was at the Apollo. There was also a little fight arena opposite the Ardwick Empire and it was known as the "Blood Tub"
While I was attending Gorton Mount School I had appendicitis and the whole class wrote to me in hospital, I atill have the letters. Some of the teachers were Miss Webb, Miss Noden, Miss Roberts, Miss Hinchcliffe and the Headmistress Miss Wilson. I am sure none of the teachers will be alive to-day but I am sure many of the pupils that wrote me will be. It is now time I closed before I write my autobiography and the history of Gorton. Keep up the good work as I am sure it is well read and also well appreciated by the people in Manchester as well as the ones that moved to other, and perhaps warmer pastures. Thank you very much indeed for that account. Some very interesting insights into a different Gorton to the one we see today. I too had appendicitis, and was admitted to Stepping Hill Hospital, Stockport. I was around six years old. My classmates from Our Lady's primary school, Edgeley, sent me letters - all decorated with coloured crayons. I seem to remember the ones by Eddy Dowling and Mary West. Subject: church on oxford rd. Thank you very much - the area round the university has changed enormously. The best building in the University is still the original one, seen in silhouette in the photo above right. my wife and i left manchester in 1972 for australia,my memory of manchester is vaugue,but on finding your web site has brought back memories of the area i used to live, can you remember the reg harris race track,also a uni building for students called the toast rack ,platt field park also was a favourite place. i used to live in carmoor road,there used to be a motor auction place called pilkingtons,also a big company near the high street baths,does anybody remeber a pub called the BLACKSTOCK,that was a favourite hang out,have not been back to manchester in 30 years there has been lot of changeslooking over the years,lived in salford for quite a while near the CUSSONS soap factory ,and the kersal cells country club,looking at you site brings back lots of memories which is great. I live very close to the area you mention. The so-called Toast Rack is still there, part of Manchester Metropolitan University. The Blackstock pub and hotel on Upper Brook St (picture upper right) is now the Micro Direct computer store. Thanks for your message. Was reading your page and someone was asking about the Secondary School in Cheetham Hill - I used to go to St Mark's School on Heath Street and the Senior School was just a bit further along on the opposite side nearer to the main road. I imagine that was the school he was thinking of. There used to be a small shop opposite the Senior School and it was called Down's. They sold buttered flatcakes and we used to climb out through the railings of the primary school at playtime to buy them. I wonder if he remembers Lorenzini's Ice Cream shop just around the corner from the senior school? And a bit further down from there on the main road was a pub called the Robin Hood and then Cheetham Baths. Interesting to see another Italian name in connection with ice cream. Near my primary school, Our Lady's, Edgeley, there was a Sivori's cafe. Sivori's also had ice cream vans. My mum has recently written an autobiography and I have offered to type it out and add pictures to it for her.I have many old family photos which I can include, but I would also love to include some photos of Harpurhey during the 1940's and 50's, as this is where she spent most of her childhood - particularly Crook Street,which stood facing Queens Park, near Upper Monsall Street,and is where she lived during that time (I think the street was demolished in the late 1950's). Any information you could give me would be greatly appreciated, and if I can obtain any photos I know my mum would be thrilled! Well, at the risk of sounding like a broken record, if you want to view and purchase old photographs of Manchester, one of the best places to go is the Local Studies Unit at the Central Library. I'm sure they have pictures of the area you menion. Best of luck to your mum with her autobiography. From or connections with: Lord Nelson, 88 Newton St, Manchester. Subject: photo of Lord Nelson ? My great grandfather used to have the Lord Nelson at 88 Newton street, Manchester. It would be nice to know if it is still there? And if there is a photograph of it? Yes, it is still there. I am waiting to get an opportunity to photograph it in good light. I'll insert the photograph here when it's ready. 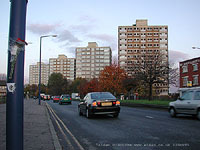 The first of the blocks of flats (the one on the right) appears to be empty. The others look occupied. I'm not sure what the plans are for them. Something needs to be done with them, that's for certain. That other symbol of failure, the Hulme Crescents development, has now gone, replaced by excellent quality contemporary style houses and apartments. I hope to feature the Hulme Crescents some time soon. Unfortunately I don't have any photos of them.